Good reporting is often just aggressive skepticism, and so my goal for this column was to do the Slate-ian thing of finding reasons why Dieselgate may not be so bad for Volkswagen. I can’t. This is about as bad as it gets for a car company. There’s almost nothing that a healthy company can’t survive and recent controversies are a good guide. For instance, the Ford-Firestone debacle involved one of the company’s most profitable vehicle lines and was the second time many people had heard about Ford’s killing people (the Pinto being the first) in their lifetime. Ford is fine. General Motors has to deal with reports seemingly every week reminding the public that they killed people with their ignition switch issue, which they’ve recently tried to settle. And yet, sales are looking pretty good. The future of airbag company Takata may be shaky, but the brands associated with it (including Honda, which owns part of the Japanese airbag maker) have mostly been able to move on. Patrick’s “Dieselgate” explainer gets into a lot of the underlying issues and it’s all bad. 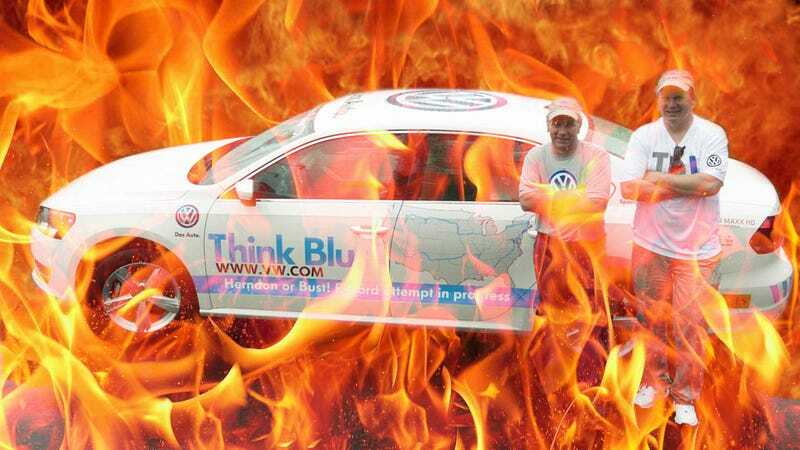 Volkswagen tried to sell a car in the United States with a “clean” diesel engine that didn’t require the kind of additives that every other person selling a diesel in the country needed. It wasn’t magical technology, apparently. It was just cheating. I think Volkswagen is now in a uniquely bad situation. Even though there’s evidence to suggest that the propensity of early SUVs to roll played a serious part in the Ford-Firestone issue, you’ve got to give Ford credit for utterly throwing Firestone under the Mazda Navajo. The Ford and Firestone family were like the Freys and the Starks until the heat turned up and Ford quickly Red-Weddinged their former allies. Honda has been happy to let Takata take the heat despite their interest in the company. While General Motors did deal with an outside supplier for ignitions in their cars, the design issues definitely fell on them and the company was happy to point to some mid-level engineers and blame the culture of “old GM” to avoid individual prosecution (thus far). It’s early yet, but it’s going to be harder for Volkswagen to convince people that numerous people weren’t involved in this. Volkswagen’s issue has always been one of too centralized control (in fact, VW CEO Martin Winterkorn was going to argue for loosening the grip of the VW mothership at an upcoming Volkswagen board meeting). VW has admitted they cheated. Here’s hoping for their sakes there’s a North American engineer or product planner willing to throw themselves on their mechanical pencil. As we pointed out earlier, Volkswagen tried to recall these vehicles in December to fix the problems. It didn’t work (which brings up another question: What, exactly, did they do and who knew that they were likely stalling?) in reducing NOx emissions. The entire motive behind this cheat appears to be that Volkswagen wanted to give their customers better performance and greater mileage at a lower cost than you can’t apparently get without cheating or some kind of additive. That performance and economy is why publications like this one could laud diesel performance. Hell, a few weeks ago I convinced a great friend of mine to buy a Golf SportWagen for his family. I said there’s no obvious good fix. There is a bad one. It’s clear that, since they cheated, Volkswagen has a mode within the electronics of the vehicle that’ll make the engines in roughly 500,000 cars they sold run cleaner. It seems likely this fix will make the cars slower and less efficient. That’s a fix that’ll make regulators happy, but it’s going to be pretty terrible for customers. The resale values of the vehicle could plummet. Volkswagen is going to face lawsuits. People will no longer trust Volkswagen and, in many cases, these are Volkswagen’s best customers. The newer (2015+) vehicles have an AdBlue urea-injection system (which injects the solution into the exhaust) and it’s not clear yet how well those work. Some number of the older cars also have this system (after MY 2012). It’s possible the addition of those systems was to fix this very problem so newer cars might be in better shape. We have an email in to the EPA asking how that will work. They could try adding AdBlue systems to the older cars, but that seems unreasonably complex. Hey, guess who has two thumbs and an invite to an event in Brooklyn tonight where Volkswagen is going to show off the newly restyled Volkswagen Passat? This guy. I have a feeling the atmosphere won’t be too jovial. The brand has struggled in the United States as it de-contented its vehicles to make them cheaper in an attempt to become the world’s largest car company. This worked, for a hot minute, until everyone realized that a cheaper Volkswagen isn’t necessarily a better Volkswagen. The brand also has failed to capitalize on the crossover boom in this country. The only thing that was holding their brand up was Golf/Golf Sportwagen sales which, in many cases, means diesel vehicles. The same vehicles they’re no longer allowed to sell. Volkswagen has also recently made a push to get people to care about diesels. So much for that. VW needed a win and they just own-goaled like sixteen times. Since the GM ignition issue regulators have been spoiling for a fight but have been limited in what they could (or would) do against other automakers with safety issues. Volkswagen doesn’t have that luxury. VW has admitted guilt. They clearly tried to conceal facts from regulators. Their political power is concentrated in Tennessee, which has little national sway right now. They’re the perfect target. Billions of dollars in fines? Almost certain. Costly recalls? Yeah, totally. Lawsuits? Yep. Individual prosecution? Unless Volkswagen HQ commits mass suicide it’s hard not to see prosecutors trying to nail someone. From where it sits now – and we’re way early in this – it seems all that Volkswagen can do at this point is to get it over as fast as possible and cut some pretty awful deals. If the company tries to put up a fight they risk exposing everything. They’re going to have to pay and, while I doubt it’s going to be $18 billion, it ain’t going to be cheap. They’ll also have to consider abandoning their diesel plans in the United States (also, I’m sure Jaguar Land Rover is happy to be doing their diesel push now that VW has made it a dirty word). Hell, at this point, they should just buy Tesla to change the subject and claim they’re doubling down on EVs.